New Zealand has a rich railway heritage. Scenic Railways in Auckland are a great way of not just learning about this history, but also entertaining the kids (young and old), and seeing the sights from something different than a bus or car. Auckland Scenic Railways are a great, nostalgic way to spend a lazy Sunday. Head up to Stanmore Bay, on the Hibiscus Coast, to take a ride around a wooden track. Alternatively, head over to Coromandel, for a day out at a purpose built railway track that goes into the heart of the Kauri forest, with amazing views out to the Hauraki Gulf. 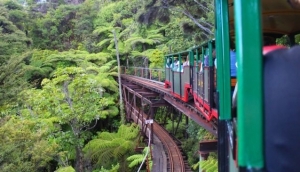 Scenic railway journeys in Auckland can be booked through most major tour operators in the city, and you may even be able to hire the railway venue out for a special occasion. And don't forget that some of the most scenic railway journeys of all, are on the modern main lines. So if you're coming into Auckland but not flying, check out the regular trains for their special 'scenic routes', and arrive into Auckland in style.